On a 1.8 hectare property surrounded by vineyards, Hotel Bellerive has an outdoor swimming pool and a panoramic sunbathing terrace overlooking Mont Ventoux and the Dentelles de Montmirail. It offers traditionally styled air-conditioned guest rooms. Each of the Bellerive?s rooms has a private bathroom with toiletries provided, a minibar, a flat-screen TV and free Wi-Fi internet access. All rooms also have a balcony with picturesque views. The hotel restaurant serves fresh Provencal cuisine, which can be enjoyed on the hotel terrace. Guests of the Bellerive can relax with a free newspaper in the hotel garden. Avignon TGV Train Station is a 40 minute drive from the hotel Bellerive and Marseille Airport is 90 km away. Guests can also visit the medieval city of Vaison La Romaine, just 10 km away and the city of Orange, 21 km from the Bellerive. The room features a balcony with a panoramic view of the Vallée de L'Ouvéze and Mont-Ventoux. It also includes a flat-screen TV, a minibar, and a private bathroom with slippers, a bathrobe, a bidet, a bath tub and a shower. With a balcony looking onto the park and Dentelles de Montmirail, the room features a king-size bed, a flat-screen TV and a minibar. The private bathroom includes slippers, a bathrobe, a bidet, a bath tub and a shower. This room is composed of 2 communicating rooms and features views of the vineyards and park, a minibar and 2 TVs. It is complete with an en suite bathroom. With a balcony looking onto the park and Dentelles de Montmirail, the room features a flat-screen TV and a minibar. This room features a bay window which opens onto a 6m² balcony with views of the park and the Dentelles de Montmirail. It is also equipped with a minibar, TV and a balcony. 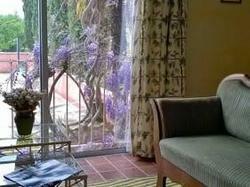 This room features a 15m² private terrace with direct access to the park and the pool. It includes a minibar, a TV and an en suite bathroom. This room features a balcony with panoramic view of the Mont-Ventoux, the Montmirail Mountain Chain and villages. It is also equipped with a bay window and a balcony.